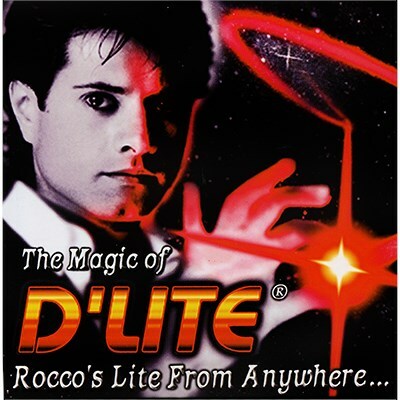 Rocco's best selling light from anywhere is now available in this latest creation, the Dazzle! Amaze your audience with the original and the best. The basic effect is that you show your hands completely empty, then pluck a bright red light from out of the air. You can toss the light from hand to hand and make it appear or disappear at any time. With this new version, D'lite Dazzle is spectacular. A dazzling bright Light that creates a flashing strobe effect as it is lit. If you thought D'Lite got attention, wait until you see Dazzle. Perform all of the standard D'Lite magic illusions and more - the possibilities are endless as you can proceed to put the light in your mouth and pull it out of your ear, or hold an ice cube in your bare hands and make it flash red at your command. D'Lite is easy magic that anyone can do and you will absolutely amaze everyone with D'Lite, from children to seniors. Available as a single, pair or junior. Select when adding to cart.